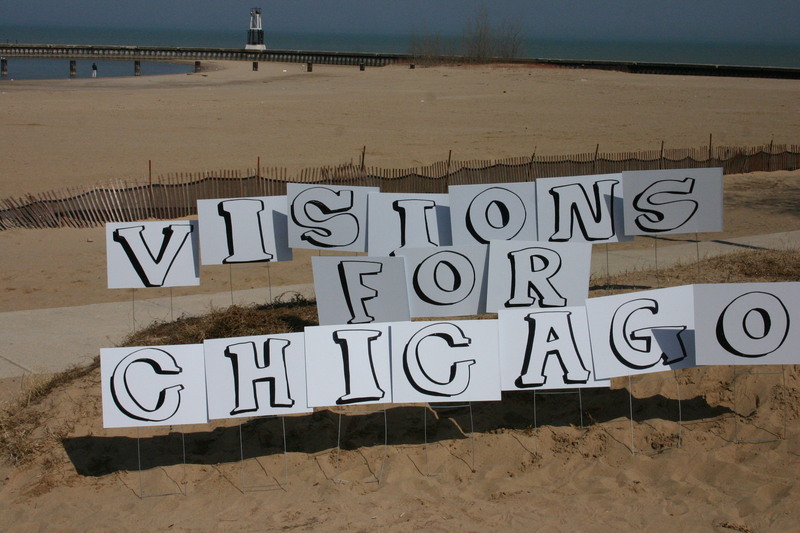 For the last 6 months or so I’ve been slowly working on this project Visions for Chicago. It was kind of project that I couldn’t resist doing. The only Mayor of Chicago I had ever known in my decade of living here, and the only Mayor Chicago had known for the last 22 years was retiring. People scrambled to figure out how to take advantage of the moment from the political upper classes to many of my left wing peers (you can read more about the political context in Micah Maidenberg’s essay here). I wanted to talk to my friends and people I had met through past projects such as AREA Chicago, Farm Together Now, the NfoXpo and Department of Space and Land Reclamation. You can read more about my thoughts on why I did this project in an interview with Abigail Satinsky of ThreeWalls and Bad At Sports podcast over at the Art21 blog here. There have also been some good shout-outs in the local press, including Timeout Chicago and The Reader. So I pitched the project to Green Lantern Press (initially it was a proposal to their gallery, which has since closed up shop) and to the Graham Foundation to get some support for materials and printing. The idea was to hand out hundreds of blank yard signs over the course of the election season and get folks I knew with political vision to articulate their long term hopes for the city by writing or drawing them on the yard sign. I gave out way more signs than ended up being made, as happens with these things. But the ones that were made were incredible, surprising and fun (you can see all of the signmakers and signs here in photos by Lauren Cumbia, Hillary Anne Strack and myself). Finally, I ended up soliciting “Vision Statements” from 16 additional people who either as a way to balance out the images with some text in the catalog of the project being released by Green Lantern Press (buy it here in their online store). The release party is happening the same day that Daley’s successor Rahm Emanuel takes office: on Monday the 16th at one of my favorite venues in town, the Jane Addams Hull House Museum (all the details are here and photos from the release are here). On a personal level this has been a really rewarding project as it has given me a chance to re-connect with lots of people I’ve met over my time in Chicago and to do something that is at once critical and celebratory of this place I have come to call home (it’s kind of like an anniversary present!) 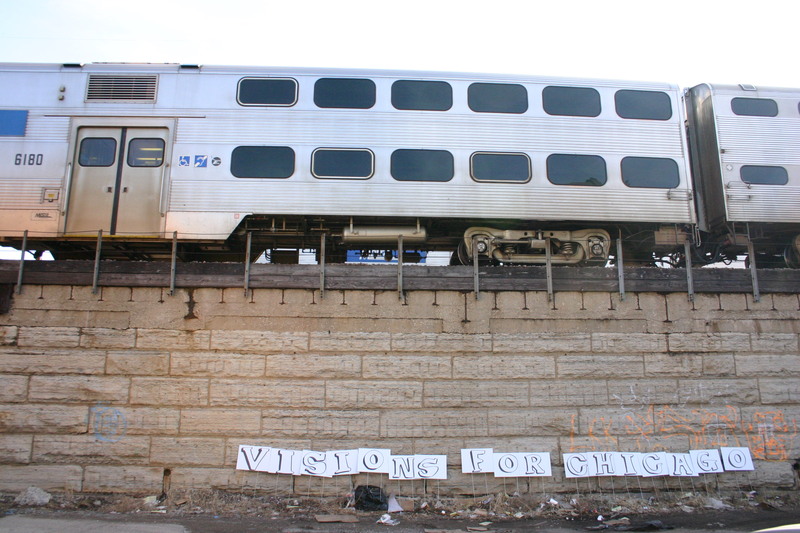 and to do a project outside of the context of a larger collective or organization as I transition into a period of less locally focused, new and very different projects in graduate school at UIC’s art program in the fall. Thanks to everyone that contributed (see the full list below), to the folks that did not contribute but engaged me in discussion nonetheless (thats what I was really looking for!) and to Chicago’s people who have produced so much incredible culture and politics that inspire me and challenge me every day. I hope that our collective visions will have a chance to bubble up and out from this point forward.